Designed to support English teachers, non-specialist teachers and teaching assistants in identifying and ‘fixing’ problems in students’ writing. Ideal for targeted support and intervention sessions at KS3. Please log in or join us to access our resources. Your search has returned 39 product results. A follow-up to our popular Reading non-fiction texts teaching pack, this pack includes a different selection of non-fiction text excerpts from the 19th, 20th and 21st centuries. The pack supports teachers of students taking GCSE English Language with a range of practical and creative lesson activities. Designed for the new English Literature GCSE specifications, this teaching pack comprises a route-through the five staves of the text, providing social and historical context, discussion points, structured lesson ideas and supporting resources. Created for the KS3 curriculum (2014), this pack focuses on key scenes from the play, with a range of drama and performance activities, as well as creative tasks including diaries, scripts, cartoons and set design to encourage close textual engagement. A pack consisting of creative and accessible ideas for bringing the play to life. Choose from socratic discussions, venn diagrams, game templates, visual learning grids and sequencing activities. Designed for the English Literature GCSE specifications, this teaching pack will provide you with lesson ideas, discussion points and creative resources. Based on the themes of the sea, travel, money and the environment, AQA GCSE English Language Paper 2 – exam skills pack will give your students all the exam practice they need. 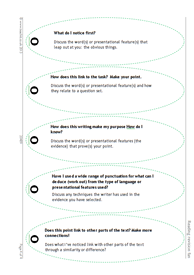 A teaching pack designed to help students understand and identify persuasive techniques and apply this to their own writing. Created to support students taking GCSE English Literature for AQA, Edexcel and WJEC Eduqas, this teaching pack includes creative and dramatic lesson ideas, resources and exam-style questions. This teaching pack includes materials to consolidate, apply and extend grammatical knowledge in reading and writing. Comprehensive teaching notes provide a valuable curriculum support for teachers, while a wide range of resources and activities ensures that students have opportunities to apply and extend their learning of the more challenging aspects of the curriculum. A versatile pack filled with teaching ideas and activities to help students at different stages of creative writing including essential sections on sentences, the use of tenses and suggestions for tackling 'problem' areas of writing, from sense based writing to using pictures as prompts. Designed to support students with more formal styles of writing, this teaching pack is a ‘toolkit’ of creative classroom activities, genuine student exemplar essays and exclusive teaching resources for all aspects of writing an essay for your class novel, play text or reading unit. Fix it writing has been designed to support English teachers, non-specialist teachers and teaching assistants in identifying and ‘fixing’ problems in students’ writing. Created to support students taking the AQA and Edexcel English Literature GCSE (2015), this teaching pack includes creative lesson ideas and activities to support your teaching of this challenging text. Designed to support students taking the English Language GCSE (first teaching from 2015), this teaching pack contains practical and creative ideas for teaching a range of non-fiction text excerpts from the 19th, 20th and 21st centuries. The current Ofsted inspection framework and standards for teachers require a focus on literacy and differentiation. Getting on with writing provides exactly this. Homework activities for year 7 is designed to ensure you have all your home learning activities for year 7 English in one place. Devised for the KS3 curriculum (2014), this ‘journey-themed’ critical reading pack consists of an anthology of text excerpts and poems (from the 19th, 20th and 21st centuries), supported by lesson plans and tailor-made resources. Literacy is high on the Ofsted and curriculum agenda, and this practical guide offers advice on how to embed and promote good reading skills across the curriculum. 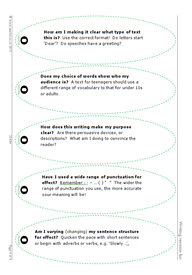 This playful, practical manual focuses on improving writing across the secondary curriculum. Less good writing provides a clear rationale for improvement as well as some effective short cuts to success. Jolly up your classroom walls with posters on reading, writing and spelling tips, common misspellings, apostrophes, paragraphing, punctuation, homophones, and connectives, we've got literacy covered. Lord of the flies teaching pack includes creative lesson ideas and activities as well as teaching resources for the whole novel. Designed for the GCSE English Literature specifications for AQA, Edexcel, OCR and WJEC Eduqas, this teaching pack provides you with lesson ideas and supporting resources for the entire play. A KS3 and 4 non-fiction and media pack consisting of teaching ideas with resources, activities and relevant and useful source materials. Devised for the English Literature GCSE (final exams in June 2015) this teaching pack consists of practical and creative ideas for teaching this popular text. Explore key poetic terms and make poetry accessible for KS3-5 students with our stylish posters. A unit of work exploring a selection of classic poetry by seminal poets. The pack is divided into: Early and Middle English poetry, The Elizabethans, The Metaphysical poets, The Romantic poets, 20th century poetry (including WW1 and Modernism) and contemporary poetry (with a focus on Duffy and Zephaniah). Written for AQA’s Power and conflict anthology, Power and conflict student revision is an illustrated revision guide comprising detailed, handwritten notes and activities to build students’ confidence and develop their understanding of the poems. Here are ten wise and witty quotations about literature, chosen for their strength, simplicity and relevance. We’re hopeful that our quotation posters will jazz up your walls and encourage an insight or two! Revise unseen fiction is an exam-focused, student-friendly workbook filled with activities designed to consolidate your students’ skills and prepare them for their GCSE English Language exam. Designed for the GCSE English Literature specifications for AQA, Edexcel, OCR and WJEC Eduqas, this teaching pack provides you with fresh and engaging lesson ideas as well as supporting resources for the entire play. Structured support for the GCSE writing exam in Spanish. An engaging year 8 curriculum pack written to develop students’ critical reading skills and confidence working with unseen texts in preparation for the new GCSE. No teacher can be there all the time. Courses, trips and off-timetable events are part and parcel of school life – and anyone can fall ill. Ever dreamed of cover work which (almost) takes care of itself? Take KS3 Cover is Teachit English's answer. The pack includes references to the current English curriculum for Key Stage 3 to help you match work to your classes. The lessons are relevant, practical and based on a wide range of engaging topics. We've also indicated the level of teacher input required throughout. Created to support students taking the new English Literature GCSE (for first teaching from September 2015), this six week teaching pack consists of practical and creative teaching ideas to support your teaching of this challenging text. Created for the KS3 curriculum (2014), this thorough and detailed teaching pack focuses on key scenes, themes, characters and language with a mix of analytical and drama focused activities. Unseen fiction is a step-by-step introduction to the unseen element of the GCSE English Language exam, developing students’ analytical skills and confidence. Designed for the GCSE English Literature specifications for AQA, Edexcel, WJEC Eduqas and OCR, this teaching pack provides you with resources and supporting teaching notes for the unseen poetry element of the exam. Your search has returned 100 site pages. Back to School Get the new year off to a flying start and take a look at a selection of the free support available to help your preparations. You can browse resources available here. Building Vocabulary Thanks to the feedback of over 1,300 teachers in the UK, the Oxford Language Report found evidence of a significant word gap in UK schools. Browse our resources to help students develop their word power. GCSE Audio media Teach your key stage 4 class about audio media. Explore pop songs, the music industry, the use of music in adverts and radio. GCSE Moving image Find teaching materials for moving image. Our resources and activities cover film genres, animation, television and video games. GCSE Print media Use our key stage 4 resources on print media. Activities and worksheets look at a range of printed media and their audience. Getting to know each other Speaking and listening activities to help your students get to know each other. Activities include hot seating, autobiography and biography name games. Getting to know your students Reflective writing activities to help you get to know your new students. Tasks include letter writing and self-reflection. For those times when you will need to play Hangman in class! Here's our interactive version that you can adapt for your English lesson. Introduction to English transition resources A selection of activities to introduce students to key topics in English, including poetry, reading and Shakespeare. Key stage 5 - prose From The Great Gatsby to Enduring Love, we've got resources covering a wide range of texts designed for your key stage 5 class. Find resources on ways to approach literature, analyse texts and explore key characters and themes. Key Stage 3 Drama resources The drama activities in this library range from starters to dramatic approaches to studying whole plays, and a dip into the terminology that might help too! Key Stage 3 Grammar and Vocabulary Promote new vocabulary and help KS3 students with tricky grammar with our collection of SPaG resources and activities. Key Stage 3 Reading Use our resources to help students develop and share a love of reading. Key Stage 3 Spoken English These resources include speaking and listening tasks, tips for giving speeches, debates and discussions, and spoken language activities. Key Stage 4 Poetry resources Our KS4 poetry library is stuffed to the rafters with inspiring and innovative poetry resources. Find worksheets and activities for all the GCSE anthologies, unseen poems and many classic poems below! Key Stage 4 Reading Promote reading for meaning and analysis with our collection of resources for fiction and non-fiction texts. KS5 Media essentials Find resources and teaching materials about media. Introduce your key stage 5 class to key media concepts, terminology and genres. KS5 Print media Use our resources and teaching materials with your key stage 5 class. Our range of activities and exercises look at newspapers, magazines, language used and the audience. New resources Discover our most recently published teaching resources, covering English literature and language for key stage 3-5. We hope you love them as much as we do! Learning mats Easy to use reference learning mats to support students with key skills including SPaG, sentence types and world classes. Your search has returned 100 newsletter results. Editor’s Pinboard: which are our most loved resources? Your search has returned 1 result.